This product requires the base game The Raven Remastered. 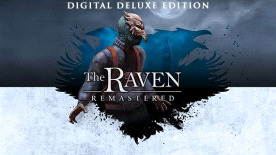 The Raven Remastered ©2018 THQ Nordic AB. Developed by KING Art GmbH, Germany. Produced, Published & Distributed by THQ Nordic GmbH, Austria. All other brands, product names and logos are trademarks or registered trademarks of their respective owners. All rights reserved. Any unauthorized copying, hiring, lending or reproduction in whole or part is prohibited.